From the eighteenth century to the present day the peace and quiet of Barnes has attracted poets, playwrights and novelists. By strange coincidence Barnes is, or has been, the home of three childrens' writers whose heroes (or heroines) are cats. 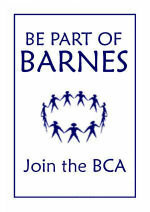 Barnes still attracts writers - and it seems writers of children's books in particular - today.